It’s been an action-packed summer in the city – or four cities and a town, should we say. We’ve enjoyed exploring our own beautiful city, along with day trips to Liverpool and Manchester and two short breaks to the historic city of York and to the stunning birthplace and home town of Shakespeare that is Stratford-upon-Avon. Shakespeare and history aside, one key ritual on all of our travels this summer is to take the time to sit down, rest our weary tourist bones and enjoy a cup of something caffeine-laden along with a sugary treat or two. It’s an opportunity to recharge the batteries and enjoy some time out or to have a good chat and put the world to rights. While in York, we called into what has become a regular haunt on our visits to this historic city – the legendary Betty’s Tea Room. Its Art Deco surroundings, complete with wood panelled walls inspired by the RMS Queen Mary, give you the impression you have stepped back in time to the 1930s. Attentive waiting staff offer you a menu bursting with a daunting array of teas, coffees, cakes and other tempting delights, while in the evenings a pianist plays. Our visit got us thinking about cafe culture in our own city. We’d love to share tips on the best places to go to enjoy coffee and cake or a cup of tea and a sandwich in and around Chester. We’ll be posting up our favourite places on the site from time to time. 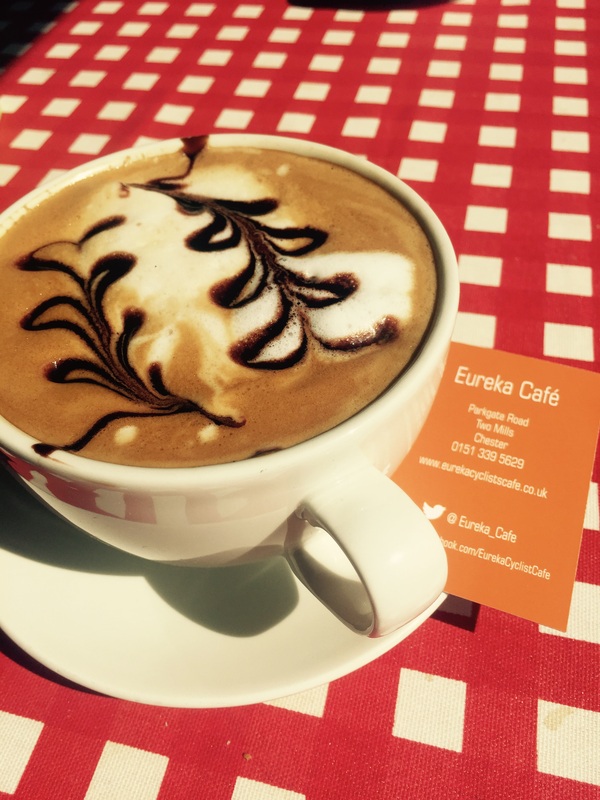 One such place we called into that is just outside Chester is the very popular cyclist pit stop the Eureka Cafe, on Parkgate Road at Two Mills. Our cappuccinos here were a little work of art and we were hugely impressed with the customer service and the warm atmosphere. Although we didn’t order any food on that occasion, it certainly looked enticing and seemed to be very well received by the hordes of hungry cyclists passing through. Another place we love is the Harvest Moon Espresso Bar on Northgate Street. Once again, even our flat whites were artistic and the coffee tastes divine. It’s also a pretty darn cool place to hang out – you never know whether you are going to be listening to a talented singer songwriter like Jonathan Coley quietly playing in the corner or enjoying the talents of the amazing Harvest Moon open mic night participants. Do you have any favourite spots for a bit of cafe culture to share with us and our readers? You can either comment on this post or email wearechester@gmail.com to share your thoughts. We look forward to hearing from you. I’m looking forward to seeing the recommendations, sometimes it’s horrible to go in to somewhere where the coffee smells delicious, but when you get it the coffee tastes burnt and bitter! We love to have coffee and cake at Brown Sugar in Handbridge. Always good. Thanks Jane. Yes, I love the fact that Handbridge has a good range of independent shops/cafes like Brown Sugar.